I’ve partnered with California Almonds on this sponsored post and all opinions stated are my own. 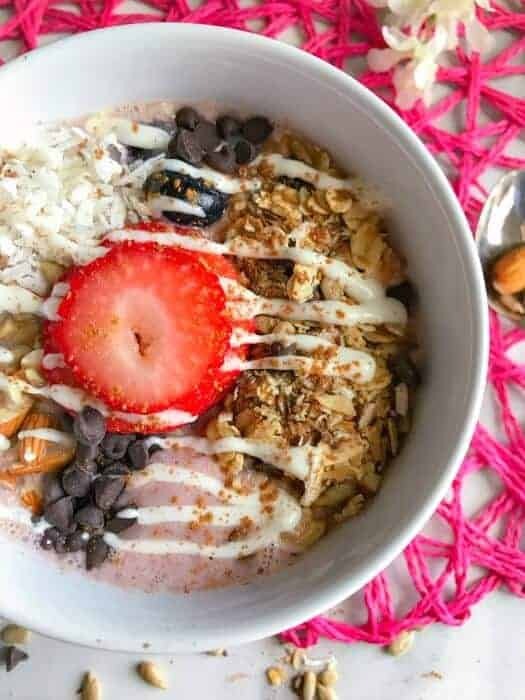 Strawberry Almond Smoothie Bowl – Vegan & Gluten-free is a creamy and delicious anytime snack or light breakfast that’s ready in 3 minutes and looks equally gorgeous. We are making them this month to celebrate love, health, and happiness. Hi Everyone and hope your day is going great. 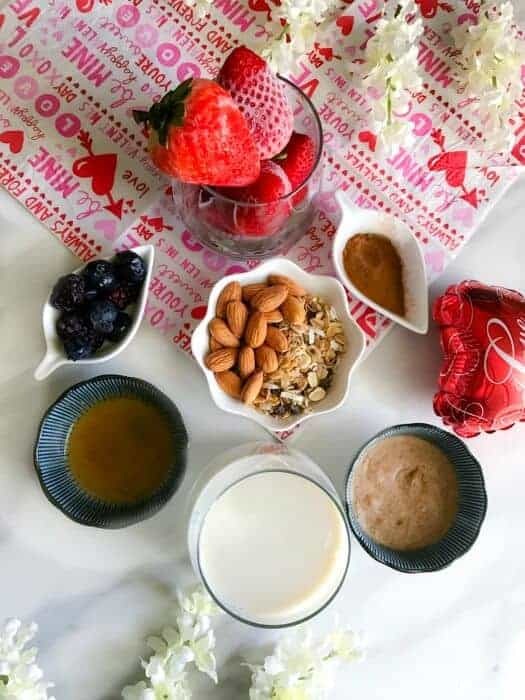 I know a lot of you would be gearing up to celebrate Valentines Day but did you know that February is a month filled with many more celebrations like Almond Day (Feb 16) along with American Heart Month and National Snacking Month. Who knew right? I’m specifically more excited as I love almonds and heart-healthy snacks and I’m already envisioning so many healthy yum to celebrate all these occasions. So, to start I’m making this super easy, healthy and absolutely delicious Strawberry Almond Smoothie Bowl . Almonds, it’s one thing that I’ve been eating since I was a child and this was all thanks to my Mom. From the initial days, she insisted on eating healthy and snacking right, so she made sure my breakfasts and snacks always had some almonds in it. So we had them toasted, mixed with recipes and all possible ways. And we all know that almonds are healthy to consume as they provide us with fiber, protein and healthy fats for a great mind and body. As you all might know, I love snacking and always striving to make some really quick yet healthy snacking recipes as who doesn’t love a quick snack. Something that not only satiates the hunger but is also delicious…..and did I say look pretty too (we do eat with our eyes). 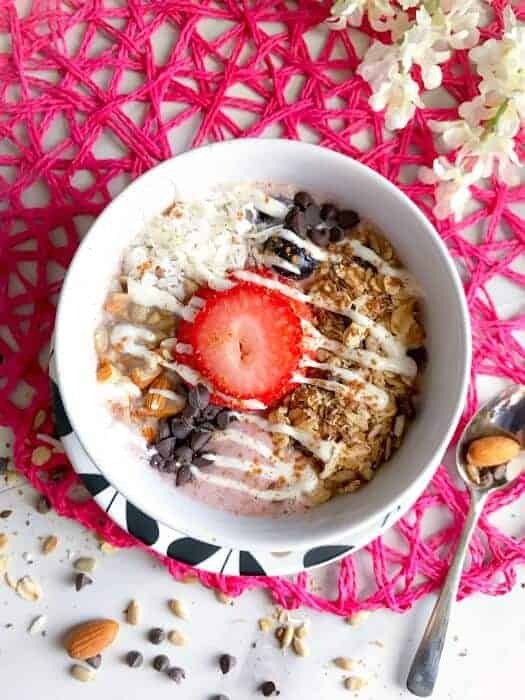 So what better way to include health+beauty+taste together than this gorgeous ‘Strawberry Almond Smoothie Bowl’. After all that holiday eating, I’m trying to keep my snacks as light as possible hence I’m leaning more towards vegan & gluten-free options these days. New research shows that a healthy handful of whole or chopped almonds provides up to 25% fewer calories than previously thought, compared to the number of calories listed on nutrition labels. Recent research shows crunching on 1.5 ounces of almonds daily curbs appetite without increasing calorie intake or body weight. A lot of you keep asking me for easy snack recipes and I feel there’s nothing easier than a smoothie bowl. Just blend your favorite fruit+dairy/non-dairy or juice together and add your favorite toppings. In fact, it’s one of my favorite recipes when I’ve friends over…as they also love smoothie bowl, so we blend some quick thick smoothies and add our desired toppings and off we go with our chitter chatter. 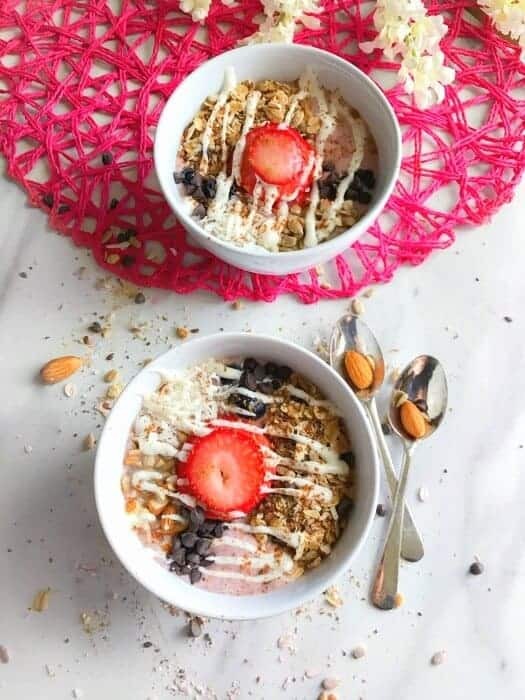 So, when a friend asked me for a quick Valentine’s day started a recipe for 2, I suggested this Strawberry Almond Smoothie Bowl – it’s pink, healthy and perfect way to start the day with someone you love. Is an excellent source of antioxidants, vitamin E, and magnesium. #easycookingwithmolly +@easycookingwithmolly on Instagram –> As I Loooove to see you recreate my recipes. Place all the ingredients in a blender and pulse to form a smoothie. Turn off the blender and transfer the smoothie into 2 bowls. Add toppings as per choice. 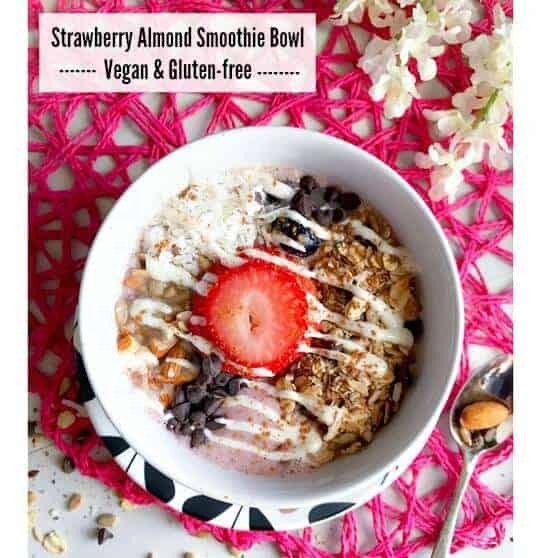 10 Replies to "Strawberry Almond Smoothie Bowl - Vegan & Gluten-free"
I did not know about Almond Day, but I do love almonds! And I love a smoothie bowl too. Great toppings going on here! Thanks Jen and I’m so happy you liked the recipe. This is how you get the morning started! So fresh and pretty – and healthy too. 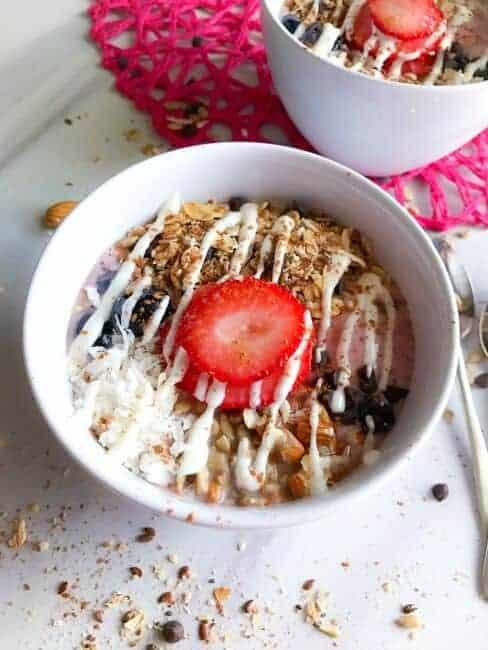 I’m adding this recipe to my breakfast bowls madness board to try! Thanks Oriana. 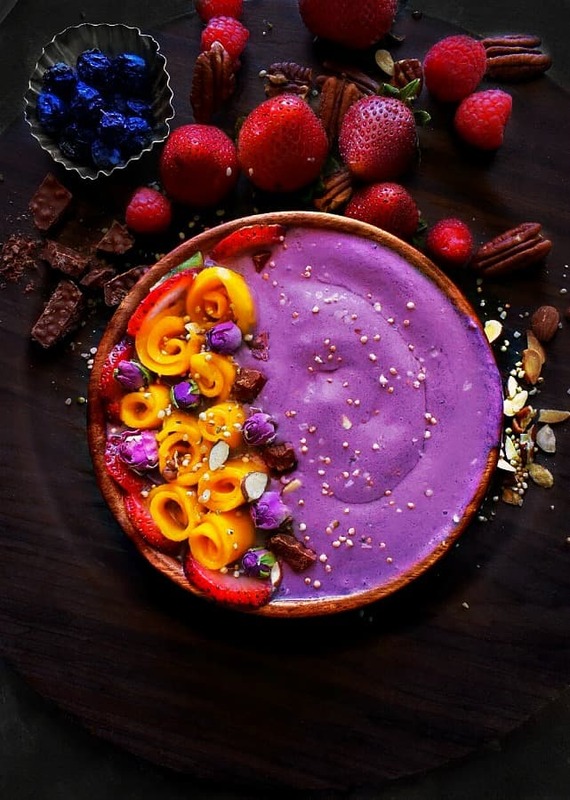 We love this particular smoothie bowl – it’s so easy n delicious. I’m so excited for some of the national food days this month, including almonds. This would be such an amazing post work out snack-all that protein! I need to break a couple of my bad snacking habits so thanks for providing such a tasty alternative! Thanks Meg. Its just so much fun celebrating all these healthy – good for us days 🙂 Glad you found the recipe and hope you can try it soon. Yum! I start the day with a smoothie most days and look forward to trying this one. Love all the toppings! This smoothie is all kinds of yum!